It's that time again, time for a GIVEAWAY! Whee! A pair of 1930s "Claremont" Oxfords -or- a gift certificate for the equivalent amount ($135 value). There are *lots* of ways to enter, from a simple tweet to sharing on your blog. Some entries are worth 2 entry points, and you can do ALL of them, to increase your chances of winning. Everyone. If you've already shared about the Claremonts, go ahead and click the method by which you shared, enter the link if needed, and you're good to go. 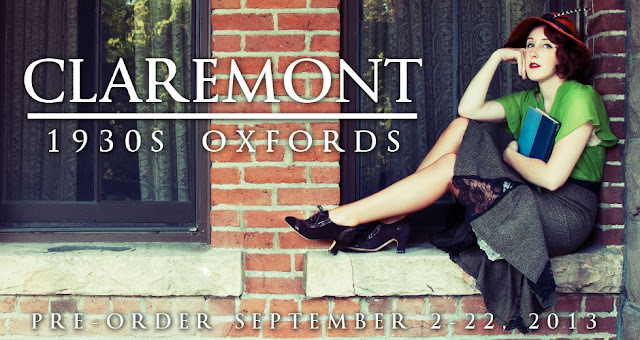 If you've already pre-ordered Claremonts and then go on to win the giveaway, your Claremonts will be free, OR you can choose the gift certificate option, to use on anything in the shop. The winner will be chosen Monday, September 16. Hi! And what with shipping to the other countries? Shared on fb and livejournal! Oh my goodness I want to win these so hard! I don't have the money to get in on the presale but I want these shoes! Ahhhh would love to win these! gorge. awesome draw! shared on g+, FB, and Pinterest (sent URL). cheers! joined your mailing list shared on livejournal, google and shared on facebook :) these shoes are so elegant and gorgeous!!! pinned and facebooked.... they are so delish! Quick note: the dates in the terms and conditions are incorrect. They say April. Yikes! Thanks for catching that! I've updated it now! Awesome shoes. Shared on facebook. Twelve entries earned. Daydreams of dancing through the Australian summer in these have given me butterflies. If I wasn't saving for University expenses and could actually treat myself I'd be getting in on that preorder. Good luck, everyone! These will make somebody look as sweet as Carole Lombard. Liked on FB, posted on my own FB timeline and joined the mailing list! I shared in several ways, and now I've a few friends who want them, too! I hope I have a little birthday luck on Monday! Shared a post on my blog! These shoes are amazing!! I love your work, your Blog and all the shoes!! 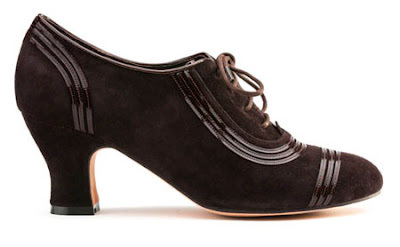 I would simply love to have these shoes, as I have been searching just such a pair of 1930s style shoes for an outfit I have planned. It would make my day to win these, as I have enter several giveaways for American Duchess shoes & hope to win at least one. The shoes are so perfectly period. I've shared on Facebook; now, to sign up for emails! 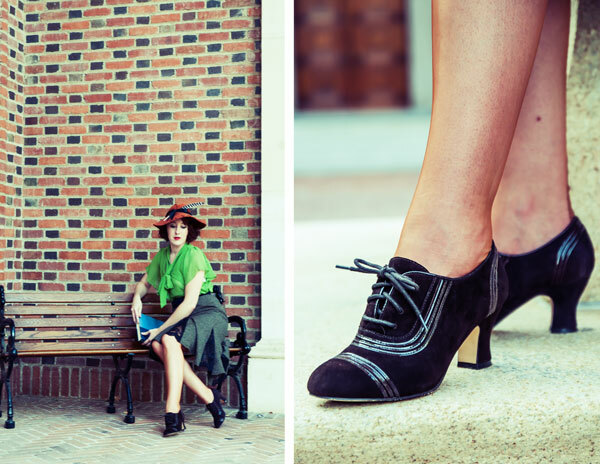 I *need* shoes to go with all the 1930's patterns I have! Oh my, I hope I win! I would like to wear these on my wedding day - I've already picked out the dusty rose velvet ribbon I'd like to use as shoelaces. Thank you! 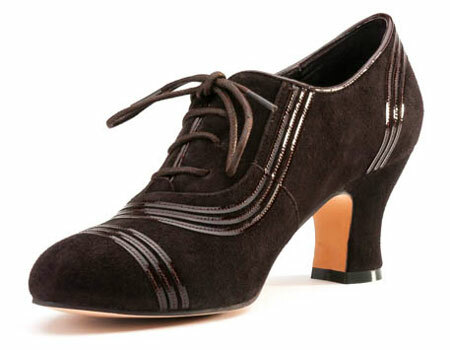 These are the perfect 30s shoes! I hope to win them for my fall wardrobe!